This page provides a brief overview and introduction to the game of pétanque — history, features, facts and legends. For petanque terminology, see English-French Lexicon of Petanque (web page) and Petanque Terminology (pdf file). For more information, visit our blog page. Philippe Boets is the the Belgian founder of the online store Petanque America (blog), the only source in the USA for competition petanque boules. Philippe is undoubtedly the single most important figure in the short history of pétanque in the USA. Through his company Pétanque America, and his company’s sponsorship of the annual Pétanque America Open, which has grown to be the biggest petanque tournament in the USA, Philippe has done more than any other person to promote pétanque in America. Bocce (properly BOH-chay, but in America BOTCH-ee), is the Italian cousin of petanque. The rules of bocce are similar to the rules of petanque, but the balls and playing techniques of the two games are different. Bocce balls are bigger (about the size of a grapefruit), heavy, solid, and made of wood or epoxy. Petanque balls are smaller (about the size of an orange), lighter, hollow, and steel. Bocce players roll the ball off of an open hand, palm up. Petanque players throw palm down, with a back-handed flick of the wrist. Bocce can be played as a backyard game on a grassy lawn, but serious bocce is played on a smooth, prepared court with high sideboards. Petanque can be played on any level patch of flat, hard-packed earth. In the USA, many more people play bocce than pétanque, so the quickest way to describe petanque to an American is to call it “French bocce”. (If that doesn’t work, “horseshoes with balls” usually does.) In the USA the best-selling book about bocce is Mario Pagnoni’s The Joy of Bocce. a metal pétanque ball. Boules may vary in size, weight, and hardness. The FIPJP (the international petanque federation) is very strict about the boules used in FIPJP-approved tournaments — boules must be of a size, weight, and hardness that conforms to FIPJP specifications, and must have been made by an FIPJP-approved manufacturer. Such “competition” boules are expensive, so open tournaments often allow players to use less-expensive “leisure” boules. This encourages people to participate in competitions. is the collective name for a family of games in which the object is to throw or roll large heavy balls (also called “boules”) as close as possible to a small target ball. The French word boule is related to such English words as “ball”, “bowl”, and “bowling”. In France, petanque is often called simply boules. Games involving rolling or throwing balls date back to the dawn of human history. The ancient Egyptians played some kind of boules game. The Greeks learned it from the Egyptians, the Romans learned it from the Greeks, and the Gauls learned it from the Romans. Today, boules-type games are traditional and popular in France, Italy, Spain, Germany and other European countries, where games are often played in open spaces (town squares and parks) in villages and towns. There are many varieties of boules games. Differences include whether the boules are rolled or thrown; how the ball is launched (palm up or palm down); whether or not there is a run-up to the throw; and in the size, weight, and composition of the balls. See the article on boules in wikipedia. In French, a clou is a nail, so a boule cloutée is a nailed ball. Before the 1850’s boules were wooden balls whose surface was often reinforced with screws or hand-forged nails. When cheap machine-made nails became available, boules manufacturers began to produce the boule cloutée — a wooden ball so heavily studded with nails that it had an all-metal surface. Starting with the development of hollow all-metal boules in the 1920s, nailed-wood boules gradually faded away until, in 1958, they were no longer permitted under the rules of the then newly-formed FIPJP. In their heyday, nails of different metals and colors (steel, brass and copper) were used to create a wide variety of designs and patterns, and some of the old boules cloutées are genuine works of art and valued collectors items. For more information, see our article on the boule cloutée. A boule lifter (ramasse boule) is a device that enables a pétanque play to pick up a boule without bending over— it is a very valuable device for a player with back or knee issues. A boule lifter is basically a magnet attached to the end of a string or a telescoping rod. Note that since the jack is wooden, a magnetic boule lifter cannot pick up a jack. When you are flying, it is important to remember that you cannot take boules on board with you in your carry-on luggage. When you fly put your boules in your checked luggage. The French have long classified boules as dangerous objects. In the USA, after the 9/11 attacks the federal Transportation Safety Administration took the same position. When you travel by air, you may not bring your boules on board in your carry-on luggage — boules are objets interdites, forbidden objects. Boulodrome Gilbert Chaufour in Dijon. A boulodrome is an indoor or outdoor area or building designed to be a place for playing boules. It typically contains several marked terrains. Large, high-end boulodromes in Europe often also include dining facilities. See Court, terrain, boulodrome. A carreau is a shot that knocks away an opponent’s boule and leaves the shooter’s boule very nearly in the spot formerly occupied by the opponent’s boule. A carreau sur place is the best possible shot in petanque— a carreau that leaves the shooter’s boule in exactly the same spot as the displaced boule. Another good shot is a palet in which the shooter’s boule knocks the opponent’s boule away and continues to roll for a short distance, but remains close enough to gain the point. The FPUSA sponsors tournaments for regional and national championships in the USA. [YouTube videos] To find a calendar of upcoming FPUSA-sponsored events, go to the FPUSA web page. Remember— if you are flying to a tournament, you cannot put your boules in your carry-on luggage. The throwing circle (cercle de lancer) or ring (rond) in which a player stands while throwing. Traditionally the circle was simply scratched in the dirt, and it was the responsibility of the team that threw the jack to draw the new circle and to erase all older nearby circles. When this was not done arguments could arise over the location of the circle, so starting in 2005 players began using plastic circles (inside diameter = 50cm = 20″). Plastic circles are available on the Petanque America web site or you can easily make your own. Launching a boule from a throwing circle. The traditional couloir. Photo by Robert Doisneau from the book “Les Boules” by Paul Garcin (circa 1950). Petanque is traditionally played in open public spaces like parks. Passers-by and spectators often gather around a game to watch, encourage a favorite team, or wager on the game. When they do, they typically form a human corridor around the playing area. The French word for that corridor is “le couloir”. Actually the word “court” is a misnomer. We use it here because many people search for that term. Pétanque is by nature a game one can play without a setup, sort of like frisbee. For those who wish to avoid the word “court”, the word “terrain” (in both English and French) is the correct term for the area where a game of petanque is played. A tennis player goes to the “tennis courts” or the “tennis club”. A petanque player goes to the “boulodrome”. See our discussion of Court, terrain, boulodrome. (co-sho-nay, piglet) — see: the jack. the lines (lignes de perte) outside of which a boule or a jack is considered to be out-of-play (perte, “lost”, “dead”); the line that marks the boundary between in-bounds and out-of-bounds areas of the terrain. In earlier versions of the FIPJP rules of petanque, the dead-ball line was considered to be a feature of a playing area that had been sub-divided into a grid of lanes (cadres, pistes)— it followed the outside boundary around the grid. Today, the dead-ball line is considered to be a feature of a particular game, so that each game played on a grid of lanes is considered to have its own set of dead-ball lines. A divot is a hole (trou) in the surface of the terrain left by the impact of a thrown boule. A basic rule of petanque is that a player may make NO change to the terrain during the game… except to fill one divot. Faire un trou is to shoot and miss; to “make a hole” in the terrain instead of hitting the target ball. “landing spot”. The spot where a pointer wants the thrown boule to hit the ground. After the boule hits the donnée it will continue to roll for a short distance. The pointer may control the “roll out” by the height and force of his throw, and by putting backspin on the boule. Before the throw, a team-mate may indicate the donnée by pointing to a spot on the terrain, but he must not make any mark on the terrain. A round or inning in a pétanque game. See mène. Fanny is, as it were, the patron saint of boules..
— To win by scoring 13 consecutive points. For example if a team had scored 12 consecutive points, the opposition could then score all 13 points and win the game with a technical fanny. Fédération Internationale de Pétanque et Jeu Provençal (International Federation for Pétanque and Jeu Provençal) is the international governing body for pétanque. Its web site is www.fipjp.com. See the discussion of pétanque organizations on this site. In petanque, a player commits a foot fault if, while throwing, he (or she) fails to keep both feet on the ground and inside the circle from the time that the boule leaves his hand until the time that it hits the ground. Beginning players, who have not yet learned how to throw in a way that lets them maintain balance while throwing, often commit foot faults by lifting a foot off of the ground while throwing. 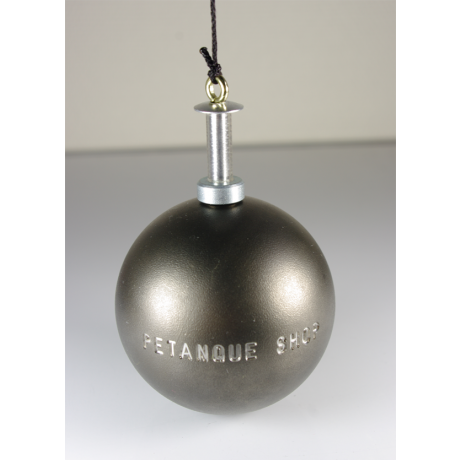 Federation of Pétanque U.S.A. — is the official governing body of the sport of Pétanque in the United States. Its web site is www.usapetanque.org. A game (une partie) of pétanque consists of a series of rounds (mènes) during which points are accumulated. Mènes are played until one side accumulates 13 points. “Game on the ground” for a team is a situation in which the team has enough points to win, unless the opposing team, which still has unplayed boules, is able to change the situation. A team “has the point” when the boule that is closest to the jack is one of its boules. The team that “has the point” after all boules have been thrown in a mène, wins the mène. When a team has the point, the opposing team throws. The phrase “We’re holding” (or “They’re holding”) is another way of saying that we (or they) have the point. When a team is holding, the opposing team throws. “Jack” is the more-or-less standard English-language term for the little colored wooden ball that is thrown out as a target. In the French FIPJP rules it is called le but (the target, goal). Players from Paris and northern France, and many American players, refer to it as the cochonnet (co-sho-nay, piglet). In the south of France and on French TV it is usually referred to as bouchon (cork). In the USA, it is sometimes called “the pig”. In bocce it is called the pallino. Traditionally jacks are made of hardwood (boxwood or beechwood) and they may or may not be painted. 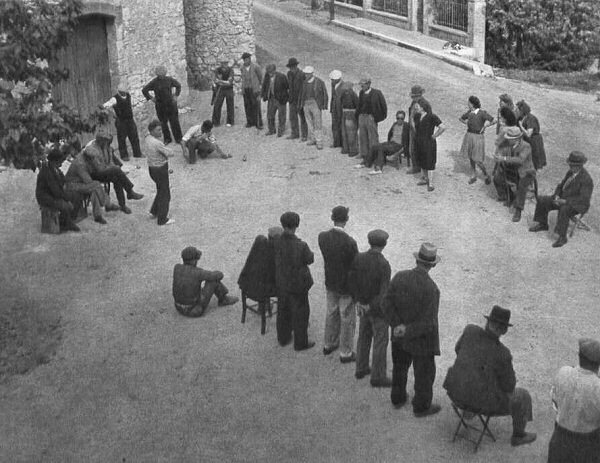 Jeu Provençal, also known as boule lyonnaise or Sport Boules, is the immediate ancestor of pétanque. Like pétanque, it is a throwing game using metal balls. But the playing area is larger and shooting involves throwing a boule while running. The famous boules scene in the movie “Fanny” shows players playing Jeu Provençal, not petanque. For more information, see the wikipedia article on Jeu Provençal. A terrain whose boundary lines are marked (typically) by strings or chalk lines. Marked terrains are often part of a grid of terrains marked off for the purposes of a tournament, or to fit inside the physical confines of a boulodrome. The opposite of a marked terrain is an open terrain. A marked terrain is sometimes referred to as a piste. is the undisputed capital of pétanque. Each year in early July the city hosts the biggest and most prestigious petanque tournament in the world, the four-day Le Mondial la Marseillaise à Pétanque, created in 1961 by the pastis king, Paul Ricard. A game of pétanque consists of a series of what the French call mènes (pronounced like the English word “men”). Mènes are played until one of the teams accumulates enough points — 13 points — to win the game. How many petanque players are there? In the USA, for 2012, the FPUSA reported around 1800 members and estimated the total number of petanque players in the United States at around 50,000. In 2009 the French Petanque Federation (FFPJP) had over 310,000 members. (It helps, of course, that the FFPJP receives government financial support.) Thailand reports around 40,000 members. Spain has the most members of any European country outside of France — 30,000. The Netherlands, Belgium, and Germany each report around 16,000 players. Algeria and Morocco combined reported around 25,000 players. All together, at the end of 2009 the FIPJP reported about 530,000 card-carrying members in 88 countries. A French company, La Boule OBUT (pronounced oh-BOOT) is the world’s leading manufacturer of competition boules. The company is located in St. Bonnet-le-Chateau, a small village near Lyon, where Jean Blanc and Louis Tarchier developed the modern process for manufacturing hollow steel boules in the 1920s. The “OBUT” trademark was created in 1955 by Frédéric Bayet, a lock manufacturer in St-Bonnet le Château. The key to Obut’s success is its modern and fully-automatic production machines, which were designed by a talented mechanic named Antoine Depuy. In 1958 Bayet and Depuis called upon the Sauvignet family to help expand the production. Today a member of the Sauvignet family still runs the business. Over the years OBUT has gradually absorbed and replaced older French boules manufactures such as JB and Elté, so that it is now the largest manufacturer of competition petanque boules in the world, with approximately 80% of the world market, producing more than 4 million boules a year. In 1991, the company created the International Museum of Pétanque and Bowls in St. Bonnet-le-Chateau. Petanque is not an Olympic sport. It probably never will be, despite the fact that the CMSB has been trying for years. However, if Paris wins its bid to host the 2024 Olympics, it probably will be one of the Olympic sports in 2024. An anise (licorice) flavored French liqueur traditionally associated with the south of France and with pétanque. One of the best-known manufacturers of pastis, and a name traditionally associated with pétanque, is Ricard. Pastis is normally diluted with water before drinking, generally five volumes of water for one volume of pastis, but often neat pastis is served together with a jug of water for the drinker to blend together according to preference. See our post on How to drink pastis. (pay-TONK) is a form of boules in which metal (rather than wooden) balls are thrown (rather than rolled) while the player stands with both feet (pieds) firmly planted (tanqués, “nailed down”). A game consists of a series of rounds (mènes), and is played to the winning score of 13. 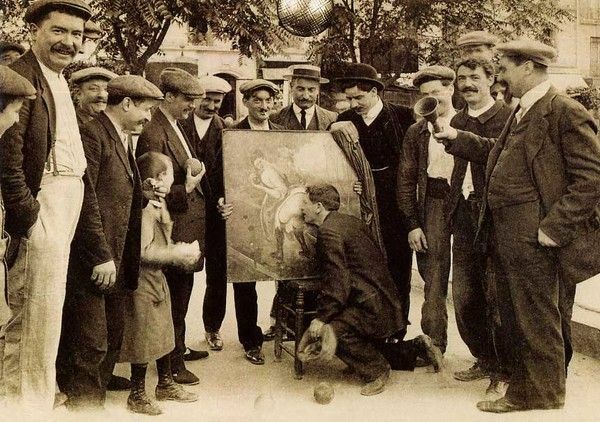 Pétanque was invented in 1910, in the village of La Ciotat, then an important port and industrial town, on the Mediterranean coast of Provence not far from Marseille. Living in La Ciotat was a shopkeeper (commerçant) and amateur boules player named Jules le Noir. Le Noir was stricken so badly with “rheumatism” (arthritis?) that he could no longer do the running throw needed to play jeu provençal. In fact, he could barely stand. One of his friends was a café owner named Ernest Pitiot. Together, the two men developed a modified a version of boules that le Noir could still play. In the new game, players no longer threw their boules with a running launch. Instead, they threw while standing in a small circle. 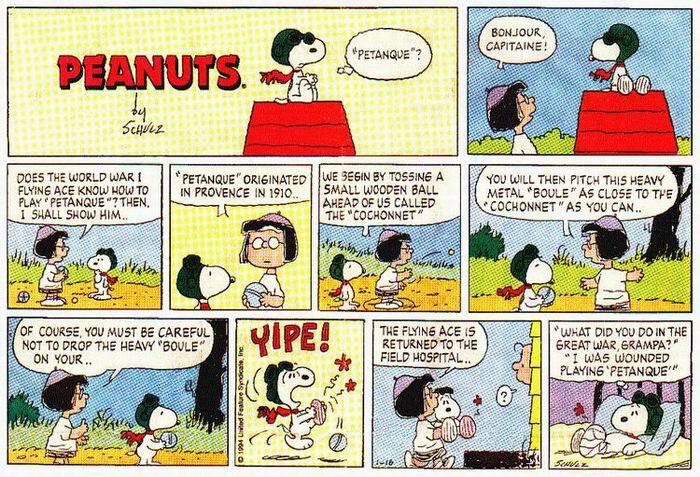 The new game eventually became known as pétanque — a name probably derived from the Provençal words pés tanca meaning “feet planted” (on the ground). 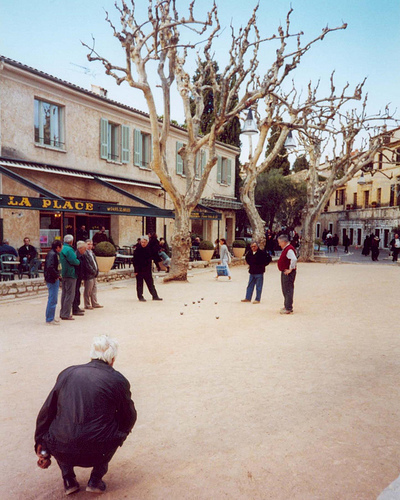 The new game quickly became extremly popular, and eventually surpassed jeu provençal to become the most popular form of boules in France. For more information, see the wikipedia article on pétanque and this very readable introduction to pétanque. The Petanque America Open was renamed the Petanque Amelia Island Open in 2017. It is THE petanque event of the year in the USA. It is sponsored by the online store Petanque America. It is held annually in November in Fernandina Beach, Amelia Island, Florida, just north of Jacksonville. 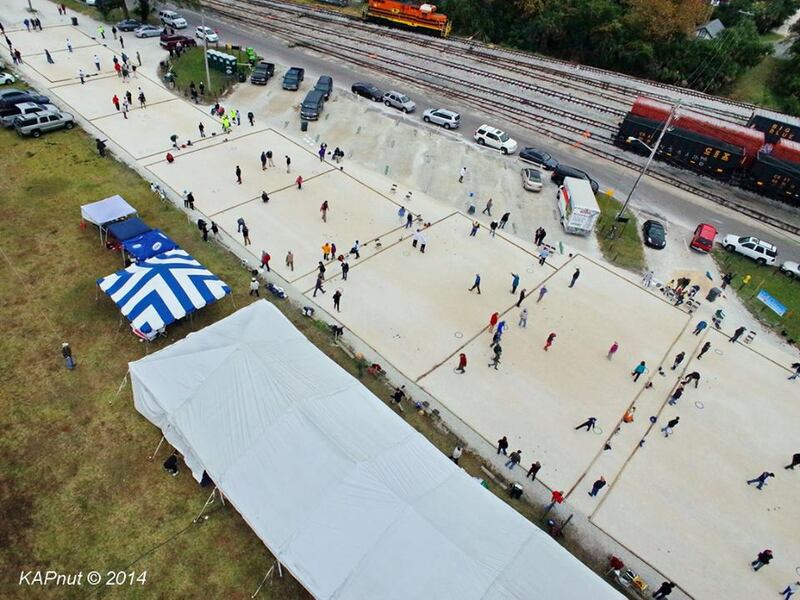 Bird’s-eye view of part of the Petanque Amelia Island Open. When strings are used to divide a large playing area into rectangular playing areas for individual games, the official FIPJP rules call the rectangular areas cadres, or lanes. Earlier versions of the rules called a lane a “piste”, and you still often hear lanes referred to as pistes. For more information, see the entry for terrain. la portée — a high lob; to throw one’s boule in a high arc so that when it lands it rolls only very minimally. A very high throw that drops like a piece of lead, straight down onto the terrain, is a plombée. Byron W. Putman is the author of the only substantive English-language book on pétanque: Pétanque: The Greatest Game You Never Heard Of. In the winter, he often plays with the Palm Springs Petanque Club. Pastis was first commercialized by Paul Ricard (“Ricard”, not “Richard”) in 1932 and enjoys substantial popularity in France, especially in the southern regions of the country. Ricard is traditionally a sponsor of pétanque tournaments, and Ricard pastis is served in the refreshment area at most Pétanque tournaments (in France, at least). The “most official” pétanque rule book is the FIPJP (International Pétanque Federation) set of rules, which are written in French. There are a number of different English-language translations and versions of the rules, including those by the FIPJP itself, by the FPUSA (USA Pétanque Federation), and by the EPA (English Pétanque Association). For more information, see our web site The Rules of Petanque. To throw one’s boule at one of the opponent’s boules (or at the jack) with the intention of moving it or knocking it out of play. This is often done when the opponent has pointed his/her boule very close to the jack. A terrain is not a physical place; it is a concept that is a part of the rules. When a game of pétanque is being played on a patch of ground, that patch of ground is called the terrain. If the terrain has no marked boundaries, it is called un terrain libre, an open terrain. In village squares and town parks in France, games are played on open terrains. If the terrain has marked boundaries, in English it is usually called a marked terrain. When a playing area is marked off into a grid of rectangles, each rectangle is called a “lane” (cadre, piste). For FIPJP international championships, lanes must be at least 4 meters wide and 15 meters long. Games like tennis have the concept of “having the serve”, but no such concept exists in petanque. Perhaps this is because in tennis you get to serve when you’ve just won a point, whereas in petanque you get to throw when you’ve just lost the point. Except for the first boule in a mène, the player about to throw the boule always faces the traditional Big Question of petanque — tu tires ou tu pointes — to shoot or to point? … as in: news stories with titles like “Pétanque becomes trendy (or cool, or hip)”. Stories appear periodically, on television or in the newspapers, announcing that pétanque is taking the country by storm. The stories are wildly hyperbolic, and fall into one of two categories. The first category includes human interest stories, often of the Strange But Interesting People In Our Town variety. Sometimes such stories even make it onto NPR. The second category includes breathless reports about the latest hot trend among The Beautiful People! In July 2010 the international media went into a frenzy after Karl Lagerfeld threw a party in St. Tropez for The Beautiful People. He gave them free customized Chanel boules. Pretty spiffy! Do women play pétanque? Isn’t pétanque played mostly by men? In France pétanque has traditionally been a man’s game, but in the USA and other countries, the percentage of women petanque players is much higher than it is in France. Nowadays, most national and international federations have competition categories for men, women, and mixed teams. The 2012 USA Women’s National Championships were held at the Maine Boules Club in Blue Hill, Maine. See also the petanquewomen Facebook group. On a drizzly day in September 2010, over 100 women participated in a women’s triples tournament in Münster, Germany. The only men in sight were the guys doing the registration. See also the comprehensive English-language source for The Rules of Petanque.